Happy Monday! 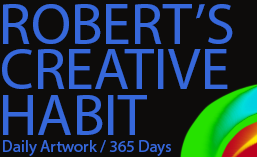 This is the second last Monday of my Year of Creative Habits project. By Sunday after the next I’ll be all finished, and this website will stay at exactly 365 posts from then on. 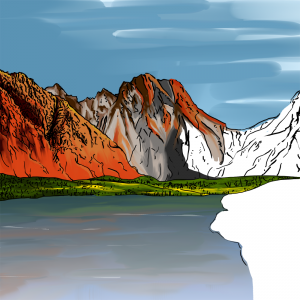 Someday I would really like to put a book together filled with all of my daily blog posts from the past year, as well as various finished pieces of artwork from that time. I’m not sure if this website will be around forever, and so I would like to have something to show for it. Even if it’s just an electronic book I can share with my friends and family, or whomever is interested in having one, of course. So, speaking of this comic book thingamajig, I thought it would be an interesting idea to have it star my youngest niece, Emily. Seeing as yesterday’s picture turned out so well, and I want to get decent at drawing people eventually. However, until I can someday draw my own people straight from scratch (do artists really do that all that often anyways? ), I thought it would be a really good idea all around to have Emily pose for me on occasion and take some photographs so I can paint her into some scenes. I’m sure she’d love to do that (haven’t asked her yet though! ), and all I keep thinking about is if I did that, and let’s say we’re years into the future and it’s successful, the character in my stories will grow up as she does. I think that’s a pretty neat idea, and from a marketing standpoint (which I have to think about once in awhile) it’s something really different that I could see people being interested in. Besides, someday I won’t be around anymore, and my nieces will be. So it would be pretty cool to leave behind something frickin awesome like that. I’ve only thought of this just yesterday, so we’ll have to see where it goes from here. Emily has an older sister, Amber, who I would also love to try and paint sometime. It could be an interesting story-line if she eventually runs into her in the story! Anyways, I think this is an idea I really want to try and figure out and make it into something solid. This entry was posted in Nature, Photoshop, Scene, Work in Progress. Bookmark the permalink.